I was glad to have an early elementary book on hand to explain the world of ants to Bookworm1. While I'm not really a fan of bugs in general, ants I can stand. Mostly. (Unless it was that grade school science book that was ENTIRELY about ants that I was subjected to around sixth grade. Or unless they are Texas fire ants.) Otherwise, ants are on the list of subjects I can stand to talk about and even look at if I must. The book is simple and basic, explaining how an ant hunts for and gathers food. It explains a ant's nest and what their yearly habits are. Remembering very little of the ant book I read in school, I got a mini refresher course that is perfect for where my toddler is. (Really, a toddler education is fine for me when the subject matter is bugs.) The book reads like a story, documenting one female ant's journey to forage for food and bring it back to the next. Kathleen Rietz illustrates this book in a manner that compliments Halfmann's tale very well. There are both up close illustrations of the ants as well as whole scenes being painted to give the reader a feel for the ant's small size in relation to the rest of the world. I thought this book was marvelous and that Halfmann has done it again! I really appreciate how she helps to bring the animal world to life for young readers. I'm glad to recommend her works yet again. 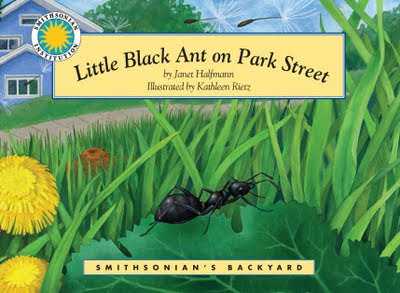 If you haven't checked out a Halfmann book, a good place to start this summer might be Little Black Ant on Park Street . Kyle is into all sorts of sciency books, so I'll have to look into these! We may be studying bugs for science in the fall and the book would complete our textbook perfectly!! Carrie, thanks so much for your great review of Little Black Ant on Park Street. I'm so glad the book helped you and your toddler appreciate ants more. And thanks to everyone for your wonderful comments. Happy Reading to All! We are moving into insects next, so this sounds like a great book to check out. I have to admit, I'm right there with you about insects...can't say I'm overly excited to be studying them! Carrie, I tagged you for the Creative Writer Blogger Award.